The eraser challenge is making the rounds in middle schools again, and it’s leaving kids with serious burns and sometimes permanent scars. I remember doing the eraser challenge back when I was in middle school. It basically involved taking one of those parallelogram-shaped pink erasers, and then rubbing it across your skin until it started to create a burn. Most of us would drop out the second our skin began to turn red or when we’d first feel the slightest tingle. But now thanks to social media, the trend is making a comeback—and this time, the stakes have been raised. At East Iredell Middle School in North Carolina, for example, parents were recently warned about the challenge after several students got hurt. A popular version of the dare has children reciting the alphabet while rubbing the skin on their arm fast and hard with an eraser. It often leads to skin abrasions and cuts, with the apparent goal to see how long the participants can last. They then “compare” their wounds. Social media is filled with videos of kids and teens filming themselves doing the challenge and wincing in pain. 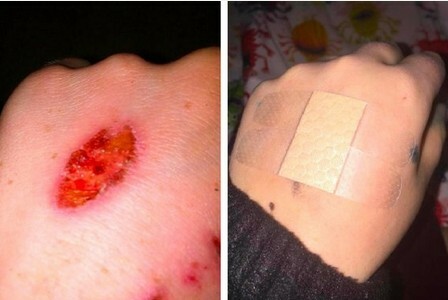 Photos show the resulting scars. I think children are lonely. They sit in front of the internet and they don’t have anyone to be accountable to,” one parent told NBC News affiliate WCNC in Charlotte, North Carolina. “I thought it was the stupidest thing I’ve ever heard in my life,” another parent told WDAF-TV in Kansas City. 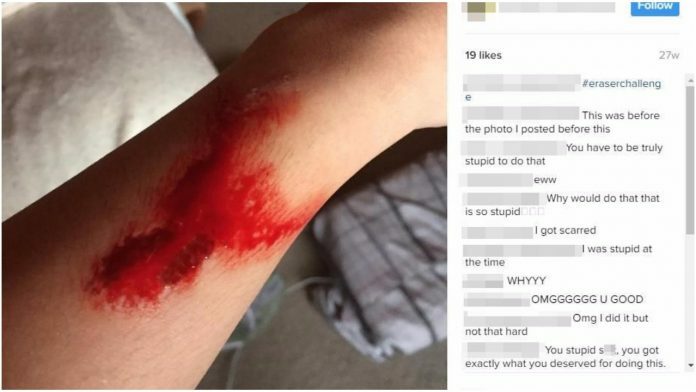 A middle school in the area warned families about the “eraser challenge” last year after noticing students sporting the tell-tale skin abrasions. Dr. Wendy Sue Swanson, a Seattle pediatrician who writes the Seattle Mama Doc blog, wasn’t that surprised children are engaging in the challenge. Be aware, talk to your kids, remind them they can get hurt, and then keep sharing what you know with other parents.